Lord of the Night reviews the stunning conclusion to the Horus Heresy Prospero Duology, Prospero Burns by Dan Abnett. The Horus Heresy returns to finish what it started in March this year with A Thousand Sons. We saw the Fall of Prospero from the eyes of its defenders, now we see it and the events leading up to it from its besiegers, the Vlka Fenryka, (which I will now always refer to them as because the name Vlka Fenryka utterly destroys the name Space Wolves with its awesomeness,). While I am not in any regard a fan of the Space Wolves, this novel has made me respect them, even if I don’t like what they did to Prospero. Magnus the Red has defied the Emperor, sworn to forever cease his studies into the Warp and the taint of magic, he has broken his oath and fallen further into the dark stain that is sorcery. His Thousand Sons and his home of Prospero must be dealt with, but who will take up arms against a brother legion?, who will slay fellow Astartes brethren if they must. The Vlka Fenryka, known to the outsiders as the Space Wolves, but also simply known as The Rout, will be the ones to bring Magnus to justice. Abnett has created a great cast for this finale, though rather then tell the story through many eyes he has chosen to utilize only one character for this. Kaspar Hawser, also called Ahmad Ibn Rustah, shows us the Vlka Fenryka as we’ve never seen them before, and his belief of the past’s importance plays a large part in the novel as secrets and lies are undone by the least likely instrument in the Vlka Fenryka’s arsenal, the truth. The secondary cast are quite varied, both in the past and present. In the past we have the conservator Navid Murza who plays an intricate part in Kaspar’s life. In the present we have the brothers of the Rout, from the taciturn Bear who is the first Astartes we see in the novel and is much more important then he appears, the Rune Priest Longfang who begins to reveal the truth of the mystery behind the scenes, and provides an interesting insight into the statement, “There are no Wolves on Fenris?”. Leman Russ is present and a new side is shown of the Wolf-King, the humour and good-nature that he displays is in stark contrast to his brutal style of warfare, but he is quite an interesting character and I hope he will appear in future novels. The action in the story is excellent. Using Kaspar as the main character Abnett has shown the fighting style of the Vlka Fenryka through the eyes of a mortal, the brutal action scenes and intricate fighting styles that some of the Rout display are very cool, and the subtly behind the use of an axe is revealed, showing a combat form that is far more demanding and harder to master than the use of a sword. The pacing is very good, Abnett transitions from the past to the present very well and shows us the story as it happens and as it began many years ago. Be it the combat, the story or the interaction of the characters my mind was always occupied by the book, never straying or feeling bored. The novel ends on an interesting note, with hints towards the future and even more hints towards the question, “Are there Wolves on Fenris?”, which will definitely surprise you, I was amazed. 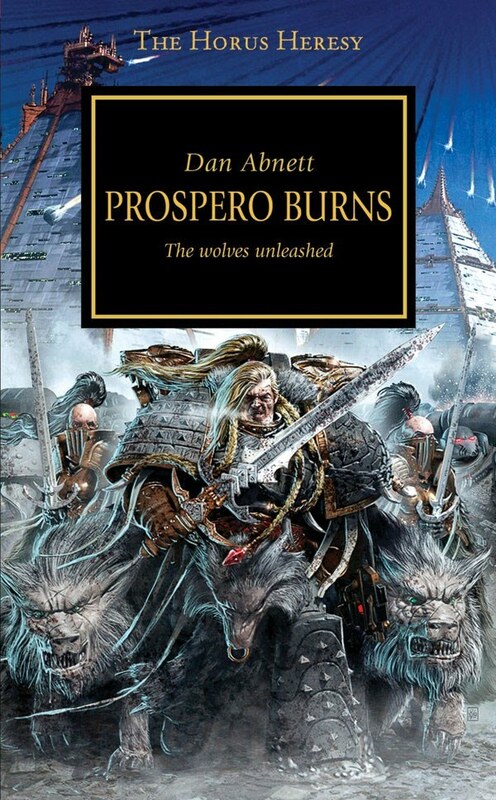 I may not be a fan of the Space Wolves but I do wish to see them again, perhaps in the future Abnett will write them again, only from their own perspective next time. However I felt that the novel was lacking on several areas. Firstly the battle of Prospero was barely even covered and the Thousand Sons hardly appeared, at most only one dying in the battle that gains attention by the protagonist and thats because he helped kill it. Secondly Abnett seems to have lost some of his linguistic talent, overusing the phrase “wet-leopard growl” throughout the novel, there are other ways you could have gotten that across. Thirdly this was advertised as a Vlka Fenryka novel and to contain the Burning of Prospero, it just barely makes the mark as a Fenryka novel and is not about the Burning of Prospero at all but rather its about the Legion, however we never see things from their eyes and only from, yet again, an innocent bystander dragged along for the ride. Abnett used that in his last HH novel Legion and, to me at least, it wasn’t very good because it isn’t what we were told we’d be getting and its a lot more interesting to see mixed viewpoints rather then just one. I give Prospero Burns a 8/10 for a great story that stretched across both the present and the past, showed us a new side to the Vlka Fenryka that some, me included, would not have believed until we had read it for ourselves, secrets that will surprise you with their incredible answers and the intricacies of their effects, action scenes that are brutal and incredible in their imagination. This is a good book but its not Abnett’s best work, that honour still belongs to Eisenhorn. Should you buy this book?, the answer is a definite yes. Even if you aren’t a fan of the Vlka Fenryka, I myself am not, you may still enjoy this book as I did. This is a must-read, despite some flaws and mis-representation the conclusion to the Prospero Duology has not disappointed, most.